Tata Steel could also resort to “portfolio monetisation” to trim its debt. 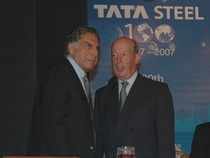 Mumbai: Taking advantage of favourable business climate, Tata Steel on Tuesday reported a stellar show for the September quarter, beating market estimates. Auto and branded retail accounted for nearly half the total deliveries made in the quarter. “We are ramping up operations at Bhushan Steel and expanding 5 mtpa at Tata Steel Kalinganagar,” said TV Narendran, CEO, Tata Steel. The company has also signed a definitive agreement to acquire 1 mt-long product steel plant of Usha Martin. For the September quarter, the company’s revenues stood at Rs 43,554 crore, 34 per cent higher year-on year. EBIDTA grew by 92 per cent to Rs 9,000 crore, while net profit trebled to Rs 3,116 crore. recently acquired Bhushan Steel. The performance of the overseas businesses though, especially Europe, was lacklustre due to plant shutdowns. Greater footprint in the more lucrative domestic market, with increasing focus on the less cyclical and higher margin automotive and branded retail segment augur well for the shareholders, who have expressed concerns over the company’s mounting debt.